The new release of Mozilla Firefox 3.0.7 has been released to fix several issues found in Firefox 3.0.6 inclusive of several security issues and several stability issues. You can now download the latest version of Mozilla Firefox 3.0.7 in variety of operating systems and languages. Read more on the Mozilla Firefox 3.0.7 release note. In fact, you can also download the older version of Mozilla Firefox 2.0.0.20 as it will be maintained with security and stability updates until mid-December, 2008. It is time to update your Mozilla Firefox to the cutting edge version 3.0.6. You can now download the latest version of Mozilla Firefox 3.0.6 in variety of operating systems and languages. Read more on the Mozilla Firefox 3.0.6 release note. Update your Firefox to version 3.0.4 that fixes several issues found in Firefox 3.0.3. You can read more on the Firefox 3.0.4 release note here and Mozilla is happily to receive your feedback or submitting a bug in Bugzilla. You can now download the latest version of Firefox 3.0.4 here in variety of operating systems and languages. Nevertheless, you can also download the earlier version of Firefox 2.0.0.18 and it will be maintained with security and stability updates until mid-December, 2008. 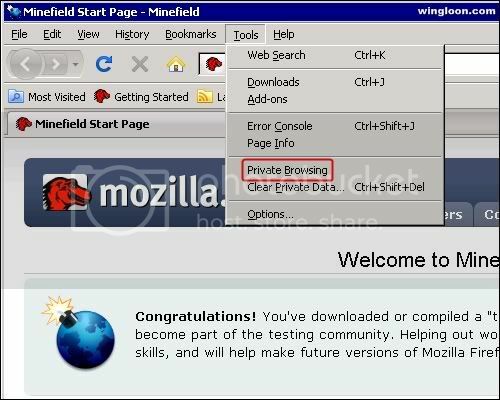 One of the new features was added to the pre-release version of Firefox 3.1 is Private Browsing. I am looking forward to this great feature in Firefox after I had an experience with Google Chrome’s Incognito. After know this news, I am excited and downloaded the latest Firefox 3.1 beta 2 pre-release version (aka nightly builds) to try which has this feature baked in. To start your Firefox with Private Browsing always on mode, type “about:config” in the address bar of Firefox, click “I’ll be careful, I promise” button to proceed, type “browser.privatebrowsing.autostart” in the Filter text box, and double click the entry to change the value to “true”. You can change the value to “false” to turn the Private Browsing feature off.